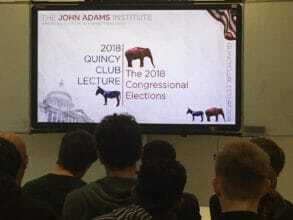 The Quincy Club is the educational branch of the John Adams Institute. Its events strive to enlighten Dutch high school students about American affairs in a non-partisan and informative fashion. Started in 2002, the Quincy Club is part of our ongoing effort to help young audiences better understand American culture. The club’s activities take students into an interactive new learning environment through American history, literature and art. This year’s Quincy Club was inspired by the U.S. Midterm Elections. The Quincy Club program is supported financially by the American Embassy.